Interiors In Green is a full service plantscaping company offering services to commercial and residential properties. In the planning stage, we provide free consultation, working with our clients to develop a comprehensive plan using plants and flowers. Our innovative designs take into consideration light, location and environment, along with creativity of plant and planter selection to meet the requirements of each client. We guarantee your plants and our service. Our supervisors routinely evaluate each account to ensure you the highest standards in service and care. 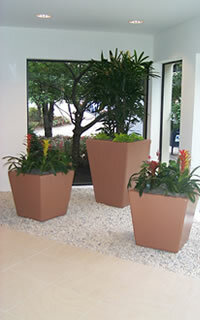 By adding a blooming plant program to your maintenance plan, brilliant colors add excitement to your environment. Combined with your plants or in stand-alone planters, a flowering plant is a beautiful way to add that special "pop" to your work environment. From radiant Bromeliads to bright Poinsettias, Interiors In Green can propose a plan that works for you.